So we went for lunch. We did have to stand on the sidewalk and wait for a table (about 1 p.m.), but only for 10 minutes. I guess I’d disagree with that this is somewhat of a dive; it was small, but actually quite well done and very clean. It didn’t have a “dive” feel for me; it’s atmosphere was more that of a neighborhood cafe. Nothing fancy, but more than adequate. High on one wall was perhaps a dozen framed articles–reviews of the restaurant. I certainly thank Jeanmarie for pointing us in the direction of Burma Superstar. It is in the Richmond district, which is a ways from downtown. But using our three-day transit pass, we hopped a #30 bus and took it from Union Square to Third Avenue, then walked a few blocks to Clement Street, and finally to 309 and the restaurant. The menu offers several styles of Asian preparations; we chose the ones marked, “Authentic Burmese Style.” Char ordered the Pork Curry with Potatoes, and I chose the Nan Gyi Dok, which is rice noodles with a mild chicken coconut curry sauce. We did the sharing thing and thoroughly enjoyed our lunch. I knew we were in the right place because most of the customers were Asian–another indirect stamp of approval for the restaurant. And, get this. The bill for the two entrees was $28, and would have been $20 if we hadn’t ordered a beer with lunch. Very modestly priced, I thought. That’s what it costs for two to go to lunch in Minneapolis. If you like Asian-style cuisine, I suggest you take the bus ride from Downtown out to Richmond. Lunch at the Burma Superstar is certainly a satisfying experience. 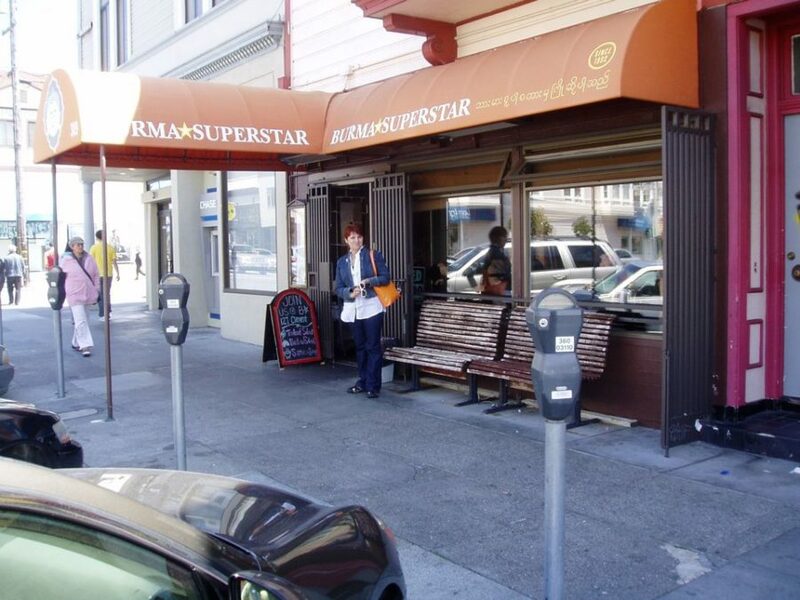 Information about Burma Superstar is available at www.burmasuperstar.com and on Twitter, @burmasuperstar.